Newark, CA – January 22, 2004 - Diamond Systems, the world’s leading supplier of analog I/O functionality in the PC/104 embedded computing form factor, today introduced its new Hercules-EBX embedded CPU board. Hercules-EBX is the first embedded CPU to integrate a Pentium-III class processor, professional-quality analog I/O circuit with autocalibration, and wide-input DC/DC power supply onto a single EBX format board measuring 5.75” x 8.00”. 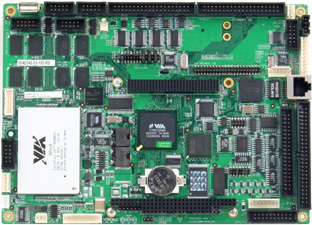 The board runs Linux, Windows 98/2000/XP, VxWorks, DOS, and QNX. Hercules-EBX was specifically designed for transportation and military/aerospace applications where high integration, ruggedness, and power supply compatibility are key concerns. The board has undergone complete testing over the industrial temperature range of -40 to +85oC. Memory is soldered on board and provision is made for latching connectors to prevent failures in high-vibration environments. Autocalibration of analog I/O circuitry maintains accuracy even during extreme variations in temperature. And the built-in 5-28V input range DC/DC power supply enables direct connection to vehicle 12V and 24V systems as well as conventional 5V supplies. U.S. pricing for the board with data acquisition is $1,100 (qty 1-9) and $880 (qty 100+). A low-cost version without data acquisition is also available. Detailed product information is available at www.diamondsystems.com. Hercules-EBX features Diamond Systems’ unique multi-range autocalibration technology, which provides maximum accuracy of the analog I/O circuitry over temperature and time regardless of the board’s settings. While competitive products utilize a single pair of offset / gain correction values for all input ranges, Diamond Systems’ AT technology provides an individual pair of corrections for each input range, resulting in a significant increase in accuracy. This corrects for inherent errors that occur when changing gain settings in an analog circuit. Diamond Systems, founded in 1989, was one of the first computer peripheral manufacturers to adopt the PC/104 embedded computing standard. Today the company is a leading supplier of PC/104 CPU, data acquisition, serial port, and power supply modules to the embedded market. The company also designs custom CPU and I/O boards. Additional company and product information can be found on the web at www.diamondsystems.com.